Lots of new stuff since I’ve been away. New York Catholic Worker Matt Vogel made an appearance in a New York Times op-ed. It referenced a march by Catholic Workers to Guantanamo to oppose torture there. It also mentioned 80 people gathering in NYC to remember Dorothy Day. Among these were Clinton’s Patty Angevine and Worcester’s Rev. John Madden. Volcanoboy reports that Mike Duffy has died. I got to know him a few years ago working on a production of “The Trial of the Catonsville Nine.” He played the judge. Damn nice guy. There’s another remembrance of him at Wormtown. 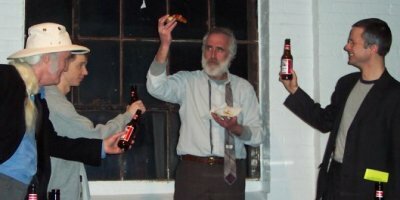 Joe Finneral, Andy Keefe, and Mike Benedetti salute Mike Duffy (center, with pizza) after their final performance. Photo: andrewkeefe.net. Based on the author’s overhears and conversations with protestors [in 2001 at Vandenberg Air Force Base], the Catholic Workers advocated peace with a Christian and semi-communistic ideology, the Santa Cruz group [Santa Cruz Direct Action Coalition] advocated peace with an organic, save the earth ideology. The Catholic Workers Group (CWG) is based in Los Angeles, CA. According to one arrestee, XXXXXX (PROTECT), CWG advocates love and peace through prayer. XXXXXX and another CWG protestor, XXXXXXXX advocated impeding NMD launches thru non-violent civil disobedience. Based on the author’s interpretation of comments made by various CWG protestors, CWG also advocates a communist distribution of resources. There are certainly individual CW folks who are semi-communist, or socialist, or whatever, and maybe the CW seems as semi-communistic to them as it seems not-semi-communistic to me. That’s how things tend to go in a non-centralized movement. So I don’t blame the FBI agent for being confused about things. Maybe we should refer to them as the “International Catholic Workers of the World” ??? The Catholic Worker movement is named after the Catholic Worker paper, which was named to compete directly with the Daily Worker. The idea was to provide the Catholic analysis and solution to the same problems that the Communists were addressing. Peter actually wanted to call the paper the Catholic Radical, which would probably have resulted in less confusion all around. Of course the Catholic Worker is based in Los Angeles! Joe DiMaggio got 247 347 pages, but somehow Sid Vicious rated only a paltry three. It is one of the delightful anomalies of our time that when the Federal Bureau of Investigation began keeping its file on [Dorothy Day], its agents felt obliged to furnish explanatory footnotes with brief biographies of Francis of Assisi, Vincent de Paul, and others.